I just don’t feel like my face is clean unless it has come into contact with water at some point during my getting up/going to bed routine. Being a confirmed ‘washer’ doesn’t stop me from being tempted by lovely smelling cleansing lotions and equally fresh smelling bottles of toner – but in general, I just don’t get it? I don’t even own a bottle of make-up remover… although, wait… does cleansing oil count? No, I’m discounting it because it doesn’t involve cotton wool pads and you still need water to use it. Any of you ‘cleansers’? If so, tell me why! Has no-one let me in on the big secret? I know it’s a personal preference thing and that there are no right or wrong choices, but I would love to undrstand the motivation behind it! I use my cleanser (Neutrogena) with water. I wipe my face off with a wipe first though to get rid of the majority of MU. I’m a ‘washer’ for sure – and I would love to know the same answer! I need to feel the splash of water on my face in order to feel like I’ve removed the makeup. I am obsessed with Cetaphil. It’s the only thing that cleans my face without breaking me out or leaving a film. I’ve noticed that the creams/toners that have nice fragrances to them end up irritating my skin, so I just stick with the Cetaphil because it’s really gentle and works great. Hi Yinka, thanks for commenting Which Neutrogena cleanser is that? I’ve never ‘got’ wipes either? Although I sometimes take them on holiday for the convenience factor… maybe I’ve tried ones that aren’t very effective? Hey Cassie, thanks for stopping by! I got myself a bottle of Cetaphil which is no mean feat in the UK (I think I paid through the nose for it too!) I agree, it’s really gentle and non-irritating – great stuff! I think I’m a bit backwards or at least confused on the whole cleansing thing. I had a cream cleanser which directed me to put it on my face, let it sink in and then wash it off. I do that with all my cleansers as it gives me clear skin and no greasies the next day. So I’m a water cleanser..I think..I cleanse, wash it off and then for extra “protection” I use a wipe all over my face. I used to be a washer myself untill my sister showed me how to cleanse. Basically id always wash when i got up and before i went to bed but after putting on the clenser and wiping my face with cotten i noticed dirt that water alone just couldent get off! Yuk.. So now i cleanse to get my makeup off. I use Boots own brand cleanser\ toner all in one which you then wash off (like Rhamnousia iv never heard of leaving it on). I also Love their own baby lotion to get makeup off or moisturize after cleansing, once i even got some in my eye but its so neutral it dident sting at all. 1. They are less harsh / drying on my skin. 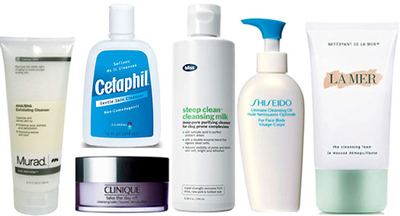 I have oily skin, & I have noticed that my skin actually responds better to moisturizing cleanser by producing less oil. Facewashes just make my skin more aggravated. 2. Oil dissolves oil principle. The cleanser removes makeup, dirt clogged in pores with sebum far more effectively. My pores are smaller & I hardly get any acne at all.